"Maddela read to the audience several racial comments one would think were written during the Jim Crow era or in Adolph Hitler's diary." 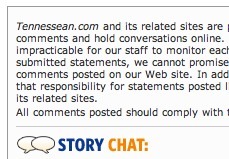 "Rather, she found them on Internet chat sites and newspaper chat forums, including this one from the Tennessean's StoryChat: 'Who the hell wants diversity? That's why we move to Williamson County in the first place. You want that crap, move to Antioch.'" "'I wish I could say racism doesn't exist anymore,' said Maddela, Nashville's first Hispanic TV news anchor. 'I wish I could say that children live in that nation where they are not judged by the color of their skin, but by the content of their character.'" Even beyond discussions of Hispanic and immigrant issues, the uncivil tone of online speech has been getting attention lately, including from the New York Times tech writer David Pogue here, and more recently in the context of a proposed blogger code of conduct (as reported here by the BBC).